Andross has declared war on the whole Lylat System ! and it's up to the Star Fox team, consisting of members Fox Mcloud, Peppy Hare, Falco Lombardi and Slippy Toad, to stop him ! Believe it or not, the story in this game is really good ! ok fine, the game actually focuses more on the gameplay, but sometimes the story mixes with the gameplay in some sections of the game and, to be honest, it does an amazing job while doing so ! however, you will not get the "true" story in a first playthrough, since you must do certain things in the game in order for the game to tell you the true version of the story, but once you do, it really is very good ! 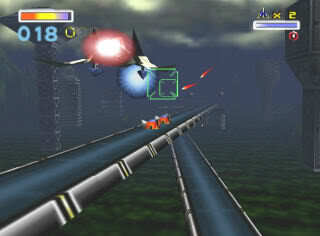 Star Fox 64 is an arcade shmup (shoot em' up) game, but instead of being 2D, the game progresses through this "Corridor Mode," which forces your air craft vehicle named "Arwing" down a fixed path straight forward through the environment, you can maneuver around the screen to move and you can also go fast and slow down, but you can't stop no matter what you do, pretty much just like in the original Star Fox for the SNES, but the game also includes an "All-Range Mode" in some stages of the game and also some bosses, where you can fly freely in a fairly large map in order to engage in a big combat. One of the things that include in the gameplay is powerups, you can find some powerups while shooting a certain group or just one enemy or by just picking them up from a certain spot, such powerups are the shield rings, which the silver ones can cure your ships damage and the gold ones can upgrade your ship's health meter if you collect 3 of them, Smartbombs, which can blow up in an area where you are pointing with a press of a button, and the laser upgrades, which can upgrade your laser's attack power where there's only 3 levels of powering it up. 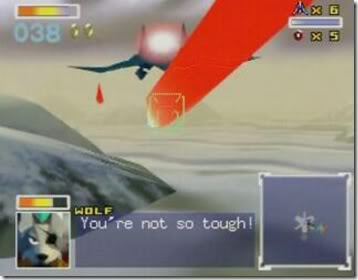 Another thing to mention is that the game has many branch out levels where you choose two paths or even three, but to do this, you must first accomplish a certain task or destroy a certain boss, but be carefull, once you took an alternate path and gone straight to another alternate level, the game can get more difficult depending on which path you took. The game is fun, but it can get a little tiresome later on, since even though the game has a lot of variety in the gameplay, it does get a little repetitive and not to mention that the game gets a little difficult as well, but since this is a shmup, I guess I cannot say anything bad about that. Well, for being a game released a year after the Nintendo 64 has been released, they do look really good ! nowadays, there are some parts that haven't aged well, but the character models look decent and the little animation box when they are talking still look good, and as for the whole, the game still looks good to be honest. The soundtrack in this game sound good ! some songs are actually memorable and some are not but they were close ! they really fit the mood in the game in a certain situation and they do it very well for the most part ! The sounds are very good too but good as in "Action-packed" good, the lasers do the classic "pew pew !" sound and the "kaboom !" sound is really awesome too ! but, strangely, there are some parts of the game where there's no sound, even where there should be ! so I don't know what happened there... and as for the voice acting, well I'll be ! there is some actual voice acting in this game ! in fact, I think this is one of those early Nintendo 64 games to have actual voice acting in them ! and even though the voice quality is not very good, the acting in each character are very good ! One unique thing that this game includes is the ability to see your teammates too ! unlike a lot of shmups, you can actually see your teammates what they are doing, they even request for help if they are in trouble just to help them take down an enemy behind them... and that's it... and you can also switch into first person view by pressing a button, and the first person view is pretty much looking from the cockpit of the Arwing ship, so the game does a great job to immerse you into the game as a pilot of an airship, and that's something you just have to give kudos for. And as for the replayability, even though the main game is really short (as in you can easly beat it in an hour or so), there is still a lot of stuff to do in the game ! 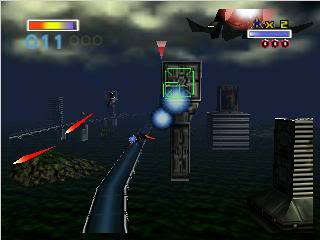 like I've said, the game has many branch out levels where you choose two paths or even three, so that you can replay the game again and do a certain task this time in order to get to the "true" story of the game, another thing this game also includes are medals, where you can collect them by just destroying a certain amount of enemies in a level, and by doing so, you can unlock some things incluiding the Landmaster tank in multiplayer mode, and "expert" mode if you collect them all, and that mode has it's own medals too ! so there is a lot of stuff to do in the game, and while some of them are rewarding, most of them are pretty challenging for doing them, so if you want to try to do some of them, then good luck to you ! The game costs 1000 Nintendo points, it's a little steep, but hey, with this so much content on this game offers, I think it's worth it ! No way ! this is the 100th review for this website ?! Thanks again to everyone for your positive criticisms ! it's truly been an honor working for this site so far ! This is the 100th review FOR REAL! Congratulations Jnes5 and the rest of the WiiWareWave staff! I CAN'T BELIEVE I FORGOT TO MENTION HOW MUCH THIS GAME COSTS ON THE WII SHOP CHANNEL !!! I think game deserves a 10/10, but your review is good. When are you going to review another game?